Bellevue Hospital Center, founded in 1799, conducts one of the nation’s most vigorous research efforts in both physical and mental health. With its prestigious history, Bellevue Hospital Center is an architectural landmark in New York City, embracing a classical building by the prominent late firm of McKim, Mead and White. Designed by LHPA, the new entrance arch respects Bellevue’s architectural history and the hospital’s urban significance. The new design for the arch, inspired by a classical stone arch from the 1930’s McKim, Mead and White building in Bellevue, is carved in stone and replicates the City Seal depicting Pilgrims, American Indians and beavers. 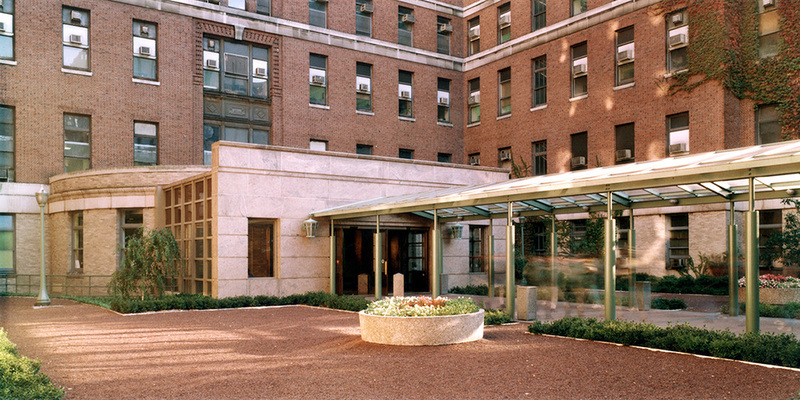 At a larger scale, our goal was to free Bellevue Hospital Center from its dismal and contorted former entrance and to ultimately create a flowing path of entry that begins at the classic stone arch and proceeds into a light open rotunda space. By opening up the space and designing a clear path of circulation using old elements of history and new elements of design, we not only provided a modern aesthetic to complement this classic medical complex, but also provided an innovative design solution for making entry and accessibility synonymous. The classical arch is positioned at First Avenue and 27th Street, giving Bellevue a strong street presence to match its civic standing. The arch frames a brick walkway of contemporary design with a peaked canopy of steel-framed Plexiglass panels that leads through an enclosed garden court to the new front door of the medical complex. The new arched entryway guides visitors through a park-like space to the restored rotunda space, which serves as the main entrance to the hospital.